Key Republicans voiced strong support Sunday for special counsel Robert Mueller's handling of the investigation into Russian meddling in the 2016 U.S. presidential election, but split on whether Congress needs to approve legislation to block President Donald Trump from firing Mueller. House Majority Leader Kevin McCarthy of California, emerges from a House Republican Conference meeting on Capitol Hill in Washington, July 28, 2017. 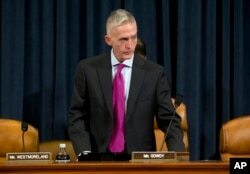 Two prominent Republican lawmakers in the House of Representatives — Kevin McCarthy of California and Trey Gowdy of South Carolina — both said they approve of Mueller's performance in the ongoing criminal investigation. But McCarthy said he sees no need to enact a law to protect Mueller, a former director of the Federal Bureau of Investigation. FILE - Former FBI Director Robert Mueller, the special counsel probing Russian interference in the 2016 election, departs Capitol Hill following a closed door meeting in Washington, June 21, 2017. 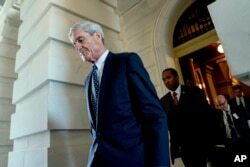 Mueller's fate is at the forefront of the Russia investigation after news accounts surfaced in recent days that Trump ordered White House lawyer Don McGahn to fire Mueller last June. but backed off after McGahn threatened to quit over the would-be ouster. 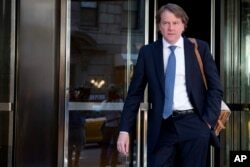 FILE - Attorney Donald McGahn, seen in New York, was is the White House counsel. Trump has denied on several occasions in recent months that he had even thought about firing Mueller and branded last week's story, first reported by The New York Times, as "fake news," his favorite censure for stories he does not like. Graham said he would be glad to pass legislation to prevent Trump from trying to oust Mueller. The former FBI director is in the midst of negotiations with Trump's lawyers over terms of Trump's possible testimony under oath about the Russian election interference and whether Trump obstructed justice by firing former FBI director James Comey. At the time Comey was heading the law enforcement agency's Russia probe before Mueller took it over. But Graham said regardless of whether legislation is approved or not, "I see no evidence that President Trump wants to fire Mr. Mueller now. It's pretty clear to me that everybody at the White House knows that it would be the end of President Trump's presidency if he fired Mr. Mueller." Gowdy said he supports Mueller's handling of the probe "100 percent, particularly if he's given the time, the resources and the independence to do his job." FILE - Representative Trey Gowdy, Oct. 22, 2015. Trump last week reiterated his long-standing contention that there was "no collusion" between him and Russian interests to help him defeat his Democratic challenger, former U.S. Secretary of State Hillary Clinton, and also said there was "no obstruction" of the investigation. He attributed his actions in trying to limit the investigation to "fighting back." He said he is looking forward to testifying before Mueller's lawyers and would do it under oath. But his lawyers subsequently said discussions with Mueller's team are still ongoing about the terms of any interview of Trump and what topics would be discussed. Comey, in notes he compiled from several meetings with Trump, says that the president urged him to drop his investigation of former White House national security adviser Michael Flynn, who was fired by Trump after less than a month on the job for lying to Vice President Mike Pence about his contacts with Russia's then-ambassador to Washington in the weeks before Trump assumed power. Trump has denied Comey's account of their talks. 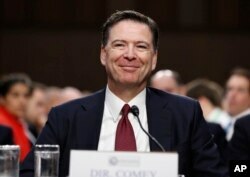 FILE - Former FBI Director James Comey smiles during a Senate Intelligence Committee hearing on Capitol Hill, in Washington, June 8, 2017. Trump, who unsuccessfully asked Comey for a loyalty pledge, dismissed him in May. A day later, Trump told Russian officials in a White House meeting he had relieved himself of "great pressure," describing Comey as "crazy, a real nut job." A few days later, Trump told Lester Holt of NBC News that he ousted Comey because of "this Russia thing," saying the investigation was "a hoax" perpetrated by Democrats to explain his upset election victory. White House legislative affairs director Marc Short told Fox News he knows that Trump is "frustrated" by the investigation, that "millions of dollars have been spent with no evidence of collusion."